Secretary of State for Health and Social Care Matt Hancock has said that barriers need to be broken down to give the NHS the future leaders it needs. The Health and Social Care Secretary spoke at the King’s Fund following the publication of Sir Ron Kerr’s review into empowering leaders in the NHS. He called on NHS leaders to lead by example to create a culture where their staff feel safe to speak out about mistakes, and where everyone understands the benefits of using new technology in healthcare. He also spoke about the need to improve diversity in NHS leadership. 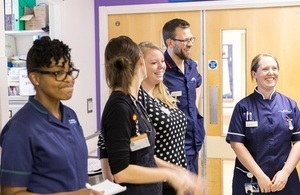 This follows the government’s announcement in October that it will make black, Asian and minority ethnic representation in senior leadership match that across the rest of the NHS by 2020. "I welcome what’s happening inside the NHS with the new Clinical Executive Fast Track scheme, the expansion of the NHS Graduate Management Training Scheme, and the Leadership Academy moving to NHS Improvement. "We need to equip staff all across the NHS with the right skills to constantly innovate and continuously realise the benefits that technology such as genomics, AI and digital medicines will provide. That starts with the right skills and capability in management and leadership."